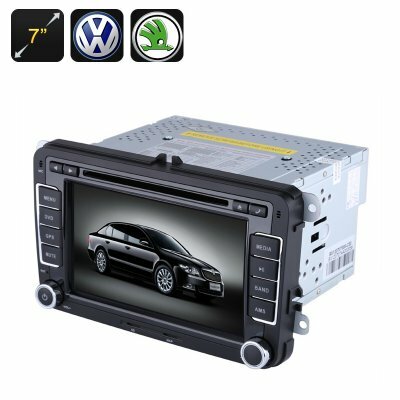 Successfully Added 2 DIN Car DVD Player - 7 Inch Screen,GPS, Bluetooth, Region Free, FM Radio, For VW + Skoda Cars to your Shopping Cart. Make your road trips more convenient with the — 7 Inch 2DIN Car DVD Player with GPS and Bluetooth. Get direction and watch favorite movies when taking a break from driving. Suitable for many VW, Skoda and Seat cars. The 7 inch screen DVD player is a great way to kill some time as you are waiting for the traffic to clear. Supporting a wide range of formats, compact and really easy to hook up, it’s a great addition to any vehicle and loads of fun on the road. The DVD player is region free, so you will be able to enjoy movies and TV shows anywhere in the world. That's not all this 2DIN car DVD player has to offer. With it, you will have a dedicated navigation system at your fingertips. Get to your destinations on time and hassled-free. In addition to entertainment and navigation, the 2DIN DVD player offers you connectivity. Coming with Bluetooth 4.0, it can easily pair to your smartwatch and let you dial and answer calls handsfree, play music, sync your phone book and more. The touchscreen keypad brings more convenience when dialing and you won’t be distracted on the road when you have an incoming call. The 2DIN Car DVD Player With GPS comes with a 12 months warranty, brought to you by the leader in electronic devices as well as wholesale car DVD players..